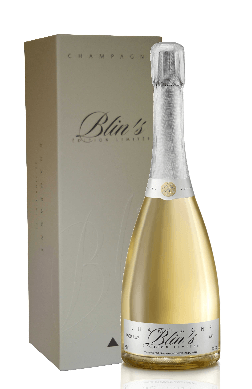 H Blin Blanc de Blancs limited edition packed in a gift box, golden yellow in colour, taste abundant mousse, floral, note of fresh butter,palate elegance and finesse, floral. THE ROBE is golden yellow, light and lively. THE NOSE immediately expresses fleeting notes of fermentation linked with strong aromas of wheat, of cereals linking with the terroir of the Marne Valley as well as the warm and gourmand vintage 2005. While warming up, aromas become refined around citrus notes, showing appearance of a sensual salty wake. THE MOUTH, texture is tight. Its confirms the wine motion around air notes, both fresh and powerful, giving the impression of movement, a controlled fluidity, such as a silky velvet or a bed sheet of mixed linen and silk. A range between the dense and the light bringing a noble appearance. The mineral notes mix with notes of stone yellow fresh fruits and bring a consistency till the finale.